Eight years after his capture as a teenager on an Afghan battlefield, a long-delayed trial began Tuesday for Guantanamo's youngest detainee. A U.S. military judge ruled Monday that purported confessions by Canadian detainee Omar Khadr can be used against him, dismissing arguments they were tainted by mistreatment and dashing the defense's last hope for derailing the trial in the slaying of an American soldier. His age - Khadr was only 15 when he was captured in 2002 - has exposed President Barack Obama's administration to criticism from child advocates. The prosecution will receive added scrutiny as this is the first trial under the embattled war-crimes tribunals inherited from the administration of former President George W. Bush. The bearded detainee sat wearing a gray suit and tie - a stark change from his standard prison jumpsuit - as the trial began Tuesday with jury selection from a pool of U.S. military officers. Opening arguments are planned for Wednesday in a trial expected to last roughly three weeks. While military prosecutors describe Khadr as a clear-eyed al Qaeda fighter, defense lawyers say he was himself a victim, forced into war by a family with close ties to Osama bin Laden. His father, Ahmed Said Khadr, was an Egyptian-born Canadian citizen and alleged terrorist financier. "He's not a real Taliban warrior. He's a kid who was put in an unfortunate situation," said Dennis Edney, a Canadian lawyer for Khadr. His capture on July 27, 2002, followed a lengthy firefight between U.S. Special Forces and men holed up inside a mud-walled al Qaeda compound in eastern Afghanistan. As soldiers entered the compound Khadr allegedly lobbed a grenade that killed U.S. Army Sgt. 1st Class Christopher Speer of Albuquerque, New Mexico. Khadr, who was shot twice in the back during the fight, was treated by U.S. medics and later flown to this U.S. Navy base in southeastern Cuba. He has denied throwing the grenade and pleaded not guilty Monday to all five charges against him, including murder, conspiracy and spying. He faces a maximum life sentence if convicted. His attorneys contend the case relies on confessions extracted following abuse in Afghanistan and Guantanamo, but the judge in the case, Army Col. Pat Parrish, said Monday that he would allow Khadr's statements as evidence. Defense attorneys say they will counter the statements with testimony from interrogators including former Army Sgt. Joshua Claus, who said at a pretrial hearing that he scared Khadr into confessing by making up a story about an uncooperative detainee who was sent to an American prison to be raped. Some officials in Washington were reportedly reluctant to see the case advance to trial in the face of criticism from opponents such as UNICEF head Anthony Lake, a former Obama adviser, who warned it could set a dangerous international precedent and lead to more youths being victimized by war. Negotiations on a plea agreement broke down, however, when Khadr rejected an offer of 30 years in prison - five more years in Guantanamo, plus 25 in Canada - in exchange for pleading guilty to all charges, according to Edney, the Canadian lawyer. Where other Western countries have successfully lobbied for the return of their nationals from Guantanamo, Canada has refused to intervene despite a recent federal court ruling that ordered it to remedy its failure to protect Khadr's rights. Khadr will sit for trial in the same hilltop courthouse where in 2006 he made the first of many appearances before the on-again, off-again tribunal system. It was later in 2006 that the U.S. Supreme Court struck down one version of the military trials, known as commissions, before Congress and the Bush administration came up with new trial rules. Obama revised the system further to extend more legal protections to detainees, but human rights groups say the system is still unfair and prosecutions should be held in U.S. civilian courts instead. Three detainees were convicted under the Bush administration, including two who have already served their sentences and returned home. 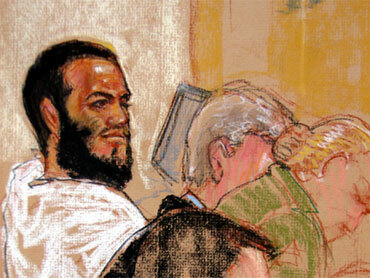 A fourth, bin Laden aide Ibrahim Ahmed Mahmoud al-Qosi, has pleaded guilty in a deal with prosecutors and is to be formally sentenced Tuesday. Obama had pledged shortly after his inauguration in January 2009 to close the prison within a year. But the effort is stalled because Congress will not agree to moving prisoners to the United States.